A new Transparency International report shows Cambodia has a problem. The government shouldn’t ignore it. Transparency International (TI) has released its 2013 findings of the world’s most corrupt countries. Cambodia came in as the worst performing country in Southeast Asia, with a score of 20 out of a possible 100 (very clean) – ranking it 160 of 177 countries. Its Association of Southeast Asian Nations (ASEAN) counterpart, Singapore, performed among the best at number 5 of 177 countries. TI’s website indicates that “no country has a perfect score” and the fact that two-thirds of countries score below 50 suggests that the ranking system is quite stringent. But as Singapore celebrates its squeaky-clean image, Cambodia is yet again on the defensive. The Cambodian government dismisses its dismal results as biased, with Council of Ministers spokeman Phay Siphan, who also serves as secretary of state, noting that “this report is not scientific” and “does not reflect the reality in the Kingdom of Cambodia.” According to TI, the results are based on seven data sources that include the World Bank and the World Economic Forum. Though Phay acknowledges that corruption is an issue, his concern is that the report neglects “other” important public sector contributions such as noticeable infrastructural developments. Roads and school improvements are two examples here. And while he may have a point, in that no statistical analysis is ever error free, and that there’s always room for manipulating variables to yield favorable outcomes, for or against something, the government is missing the bigger picture: On balance, Cambodia comes in as very corrupt compared to its counterparts throughout the world. And the Corruption Perceptions Index (CPI) holds each of the 177 countries to the same standards, particularly in terms of data analysis and interpretation. Phay’s concern, therefore, is effectively moot. Getting other countries – with both impressive and dismal results – to challenge TI’s findings is the only way to lend credibility to the Cambodian government’s concern. But that’s unlikely to happen, just as the ruling Cambodian People’s Party is unlikely to acquiesce to demands made by the opposition as conditions for negotiating the political deadlock – among them to investigate electoral irregularities. Some analysts believe that Cambodia’s inability to pass key reforms, including the Freedom of Information Act – a draft of which had been rejected earlier this year – may have contributed significantly to this year’s poor ranking. 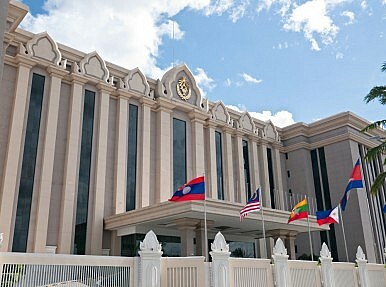 In 2012, Cambodia was ranked 157 of 177 countries. Other contributing factors may include the absence of a clear system of checks and balances in the public sector, despite more than two decades of pressure for reform. In all fairness, though, the Cambodian government has acted recently on reforms – in the public and private sectors – more so, and much quicker, this post-election season than following any of the past four mandates. From that, we can assume that the government recognizes its waning power and expects to bend heaven and earth to avoid another costly blow at the ballots. That matters because power lies in those ballots, something the ruling party can ill afford to lose. Whether such reforms have staying power – or real teeth – is entirely a separate issue. But for now, finger pointing isn’t helpful. Most of us are familiar with the problem: Corruption is endemic in Cambodia. We know this. More important, however, is unpacking the political and economic implications going forward. How does a culture of corruption impact the business climate in Cambodia, and foreign direct investment in particular? Who’s risky, if not foolish, enough to invest capital in a country that lacks transparency and accountability? And for those who have already invested, bribery and kickbacks seem to be part of the process, as recently evidenced by the embarrassing scandal that unraveled involving global mosquito bed nets. Other examples are more than readily available. Another difficult pill to swallow is the fact that major businesses and corporations are sprouting up next door, in Vietnam and Thailand, for example, but are still apprehensive about entering Cambodia’s market. One need not look past any of the major international consulting firms to this. Not finding a credible way to remove the residue of corruption is short-sighted. Just think about the sheer amount of additional resources foreign companies would be willing to invest in Cambodia without corruption being a major deterrence? Whether one takes issue with multinational corporations or not, it’s hard to deny the fact that many more jobs will be created as a result of added investment, which is likely to spur growth in other areas because disposal income increases. That certainly lends itself to building more schools and paving more roads, something everybody seems to want, without the corruption factor, of course. That’s long-term thinking and planning. Still, it doesn’t help the government, or anyone for that matter, to use simple arguments like, “Corruption happens everywhere, including the United States. So why single out Cambodia?” Yes, corruption does happen everywhere, which is why the TI CPI report is so useful: it holds the entire world accountable, not just Cambodia. No-one cares whether Cambodia’s reputation is bruised or tarnished, and the government shouldn’t care either. It’s pointless to pick apart other countries when trying to justify one’s own flaws. Take this report – and others like it – for what it is, which is a global reminder to live, breathe and operate ethically. If the Cambodian government is truly interested in moving out of “developing” status by 2030, then the first thing it ought to do is clean up corruption. That’s the biggest hurdle. Ignoring the problem doesn’t help. Simple math shows the country needs more investment, so as to become less dependent on loans, which sinks it further into debt, which isn’t good for development. That’s antithetical to everything the government hopes to accomplish by 2030. What most of us care about, to be sure, is whether or not Cambodia’s leaders have the fortitude and gall to put its money where its mouth is, to replace empty words with respectable actions. Those of us interested in seeing Cambodia move forward will be watching very closely. Peter Tan Keo is an independent analyst and founder of Global Strategy Asia. He was educated at Harvard University, The University of Chicago, and is completing a doctorate from Columbia University. His research examines post-conflict reconstruction, education, and youth empowerment in fledgling democracies, with a primary focus on US-ASEAN relations. Follow his blog at usaseanforum.blogspot.com and Twitter @peterkeo. The country records the region's worst score in Transparency International’s annual corruption index.